eBay Store category Sign Up Now ! 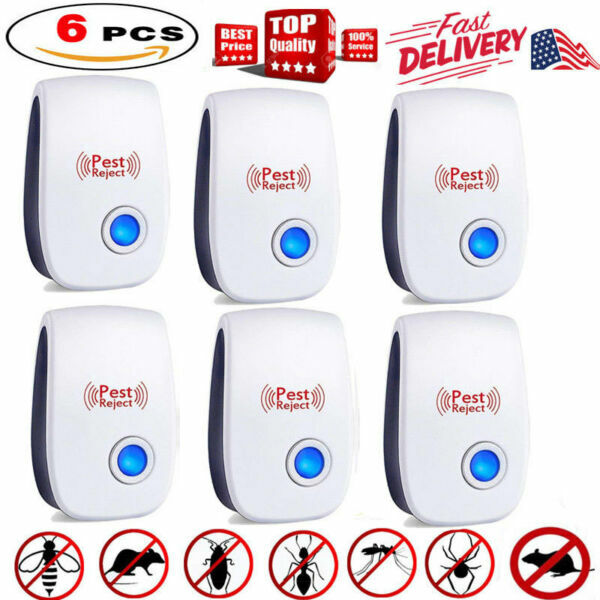 You may also like 6 pcs 2019 Ultrasonic Pest Repeller Control Electronic Repellent Mice Rat Reject Product Description Product Description:This 6Pack Ultrasonic Pest Repeller Control Electronic Repellent Mice Rat Reject 2018 applies a powerful ultrasonic wave to repel away bugs, mice, cockroaches, rodents, spiders, ants and rats, while remaining fully safe for humans and pets.Product Features:Works by continuously transmitting a powerful range of ultrasonic sound waves that drives away pests, while remaining completely inaudible to humans and pets.Non-toxic and harmless to humans and pets, an alternative to toxic chemicals and dangerous traps.Protects an area up to 80-120 square meters per unit.Low power consumption, suitable for long time operation.Does not interfere with the operation of radio, television or other electronic equipment.Specifications:Color: White + BlackMaterial: ABSPlug Type: US Plug/EU PlugPower Supply: AC 90V-250V, 50-60HzPower: 5-6WUltrasonic Frequency: 22-65KHzEffective Range: 80-120 Square MetersWorking Temperature: 0-40°CProduct Size: 90 * 55 * 50mm / 3.54 * 2.16 * 1.97inProduct Weight(1pc): 47g / 1.66ozPackage Size: 13 * 10 * 10cmPackage Weight: 242gPackage List:6 * Ultrasonic Pest Repeller（US PLUG）Note:1. This machine should be installed at 80-120cm away from the floor.And vertical to the floor and plug to the power socket.2. The installing point should be avoided to be in the back of the curtain,fridge, and any other furniture that deterring or attaching frequency.3. It's normal that the mouse and vermin will increase at the beginning of the using days.Because they are moving away from their living place after the attack of ultrasonic.4. Don't clean the machine by strong impregnant, water or damp cloth.Use dry and soft cloth with some neuter wash to clean it.5. To increase the effect, you should use several sets machines at the warehouseor goods pile-up, several rooms.Converse : 1 inch = 2.54cm or 1cm = 0.393 inch Shipping Payment Return & Refund policy Feedback Customer Support - Contact Shipping FREE SAME BUSINESS DAY MONDAY- FRIDAY SHIPPING FROM USA. All orders and payments received before 4PM EST (1PM PST) will be shipped the same business day. All other orders within 1 business day. No shipping on Weekends or US Public Holidays. No responsibility for any custom duty Shipping information will be updated when available. Payment We accept payment via PayPal. Use PayPal at checkout to pay with credit or debit. Immediate payment is required. Shipping will be arranged within 1 business day once payment is cleared. Return & Refund policy 1.We stand behind our items and offer 60 days warranty. All items are in new and working condition unless specified otherwise elsewhere in the description. 2.All Returns - defective or otherwise - MUST BE PREAUTHORIZED to guarantee refund or exchange. Please contact us to get an authorization and return address. 3.Buyer agrees to pay for the cost of re-shipment for undeliverable or wrong addresses. 4.Buyer is responsible for Return Postage as well as a 20% restocking fee if return/replacement is not a result of our mistake such as wrong item. 5.Replacement or Refund will be made upon receipt of the returned item. Please include tracking number so we can process ASAP. If you do not wish to wait for a replacement, please repurchase the item. 6.ALL REFUNDS will be processed via PayPal. Please double check via PayPal history and transaction for confirmation. PayPal will send it back to whatever you used to pay within 3-5 days. Feedback We strive to provide the best products and services. If anything about your transaction did not meet expectations, please CONTACT US and give us the opportunity to make things right. We are always here to help. Customer Support - Contact Please do not hesitate to CONTACT US. You can message 24/7 on eBay for all questions and inquiries. We will get back to you within 1-2 business days at the latest.